As in , clown avatar, or mod? Last edited by Sarge; 01-04-10 at 11:51 AM. 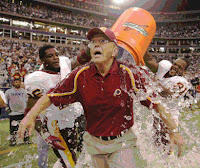 He was the head coach of the Washington Redskins. No, I don't consider him a clown. I consider him a really nice guy, very comfortable in his own skin, simply in way over his head in a situation in which he was also set up to fail. Love the guy, hate what happened to my team under his watch. As to the avatar itself, I was (mostly) kidding. I'll be making him one, because we intend to have every coach and player ever to grace the maroon and black represented eventually, but it won't be one that makes him look like a fool. Let's not forget, even legends get owned by the camera sometimes. I agree. I have no hatred or ill will towards the guy. Who among us, if the boss came down and said "Do you want to be Da Man?" wouldn't do it, especially with danny dollars looking at us? Thanks, Lanky-Good God, I could have a field day captioning that one! Maybe it's just me, but Zorn looks like he's dripping contempt in that pic. The expression I'll always remember is that lost/puzzled look he always seems to have on the sidelines.